As part of early-season scouting, assess plant density and percent emergence using the Canola Calculator plant survival calculator. Problems with seeding equipment, seedling diseases, flea beetles, moisture (or lack thereof) and other factors can influence seed survival, and unless scouting and plant counts are done repeatedly through the first few weeks after seeding, these influences may be missed and the seeding tool or other seedbed conditions may be unfairly blamed. On the other hand, counts can help you decide when it is time to make improvements to your seeding implements. The article Start scouting the week after emergence has lots of scouting tips. 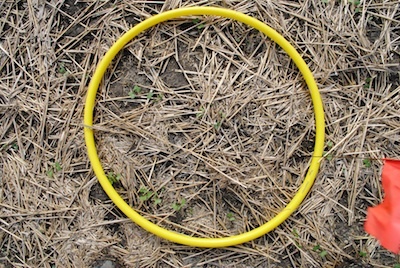 Hoops or metre sticks are simple tools for plant counts. Stubble counts at harvest provide a useful measurement to look back on the year. How to use a hoop to do plant counts. NOTE: When doing plant counts, be sure to subtract volunteers. Plants growing outside the seed row are likely volunteers. Very early looking plants are also likely volunteers. You can check by looking for the blue seed coat around the seed.